If your idea of the typical professor is an old, out of touch, white-haired man, then it’s very safe to say that Michael Sharp is not your typical professor. For those who have taken any of his English classes, then you know what I’m talking about. For those who haven’t, plan better for next semester. Professor Sharp began his own higher education at Pomona College, a small liberal arts school in Claremont, California. He slowly moved out East, getting his doctorate at the University of Michigan in 1999, before beginning to teach at our own Binghamton University. As of now he teaches 17th Century Literature, British Literature 1, Crime Fiction and, of course, a class on comics. Perhaps the whole appeal of his classes is that, for someone who teaches hundreds-years-old literature, he couldn’t be more culturally well rounded. Take one of his two blogs, for instance. Each post of Pop Sensation features the cover art of one of Sharp’s old paperback novels — of which he has over 3,000 — along with witty commentary of the campy-yet-wonderful covers. The approach is emblematic of Sharp’s overall style: He takes information seriously — and in mass quantities — and relays it in a humorous, modern way. Though he teaches some of the most revered works of Western literature — “The Aeneid,” “Inferno” — he doesn’t put them “behind glass.” Everything should be subject to criticism. This style reflects not only in his teaching, but in his hobbies as well. This year, Sharp is embarking on a personal project to revisit the ’80s, when he grew up, attempting to view the era more objectively, and in more detail than just what his memory holds. Each week, Sharp checks what was popular at this time in the year 1980. He then reads a book and watches a movie from that time, as well as takes in other parts of the time’s culture. To stay current, he also reads something contemporary in the same week. So, two books every seven days. Not an impossible feat, but surely one that requires dedication and a love for reading. And yes, professor Sharp does love to read. “Reading a lot can turn on my brain in ways other things do not,” he said. But that doesn’t mean it doesn’t require work. Sharp grew up playing tennis and video games, and while he liked the idea of reading, the effort to sit down and do it could often be daunting. He described it like meditating. One day, he realized that there is so much left to read, with a finite amount of time left to read it, and with that, his voracious reading habits really kicked in. So what else does Michael Sharp read? Simply put, everything. “I like books, and short stories, and comics,” said Sharp. Which of course explains the background to his Comics class. With an extensive knowledge of comic books and graphic novels, his reading list for the class includes Captain Marvel and Wonder Woman, among others. This semester, almost every assigned reading features either a strong female protagonist, or a female creator. His interest in comics didn’t start as a teenager, but rather in 2003, with Marvel’s release of the controversial comic, “Rawhide Kid,” where the main character is gay. After reading “Rawhide Kid,” Sharp kept returning to the comics section of the bookstore. Now, in his class, he imparts his knowledge of “sequential art” with those lucky enough to get a spot in the class. If you haven’t heard of professor Sharp, then maybe you’ve heard of his crossword-solving alias, Rex Parker. With a following of roughly 20,000 people, Sharp, or should I say Parker, runs the blog, Rex Parker Does the New York Times. Each evening, Sharp completes the next day’s Times crossword. He then posts the answers online, along with his thoughts on the puzzle, a word of the day and any other musings he might have. Like any internet celebrity, Sharp’s online presence was originally unknown, and then grew “exponentially.” Those researching the crossword found his blog, and from then on, the persona of “Rex Parker” was born. But why use a pseudonym? In 2006, the whole idea of a blog was embarrassing, Sharp said, so he published it under a fake name, and even began writing it with a fake voice “like I was some weird space emperor,” said Sharp. And while he eventually realized that he could not continue the fake voice, the name was how he was known, and it was there to stay. It originated from a vacation years ago, when he and his fellow travelers decided to come up with “60s beach movie names,” his being Rex Parker. 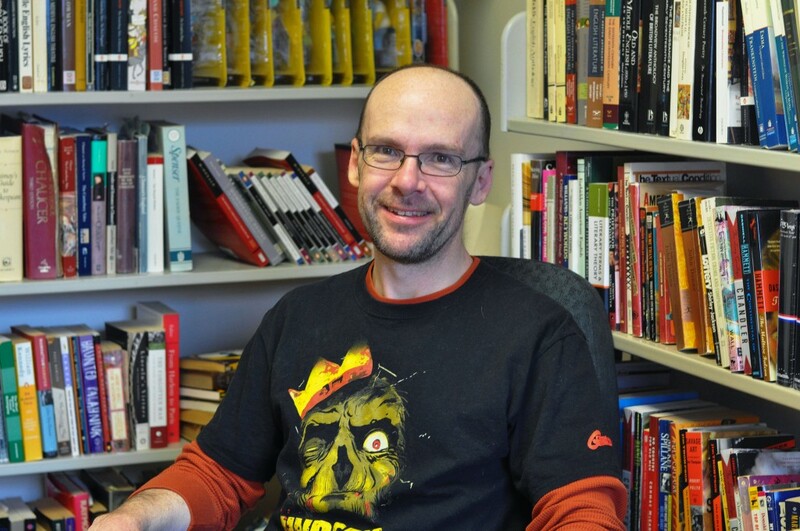 Most recently, professor Sharp was ranked as the 63rd best crossword solver as of the 2014 American Crossword Puzzle Tournament, an annual competition directed by Will Shortz, the puzzle editor for the New York Times. The competition is the oldest and biggest of its kind in the country, and it ranks its contestants by their speed and correct number of answers. He’ll be competing in the Third Annual Finger Lakes Crossword Competition on March 7 in Ithaca, New York. So there you have it folks. Your Brit Lit 1 classes are taught by a crossword-solving, comic-book reading, Sleater-Kinney listening, blogging professor. The best way to describe him is witty, smart and for a lack of a better word, sharp.